The compact premium class is one of the most competitive at the Honest John Awards, but the latest C-Class pushes its way to the front with fine handling and sophisticated style. Inside it feels every inch the premium car it should be with excellent build quality and lots of upmarket materials. In short, this is the best C-Class ever. Dan Powell Managing Editor of HonestJohn.co.uk said: "The Mercedes-Benz C-Class is the go-to choice for company car drivers who want a luxurious and rewarding daily driver. 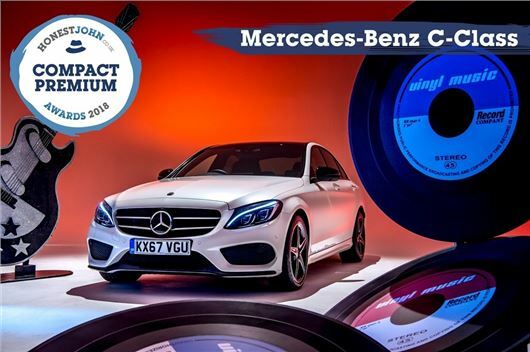 A deserving winner of the Compact Premium Car of the Year award, the C-Class provides everything you’d expect from a Mercedes-Benz, while injecting some fun and dynamism with its razor sharp drive and accomplished range of engines." Not a compact price. What's reliability like? In a massive customer survey recently in the USA, Mercedes came 15th manufacturer for customer satisfaction, reliability being one of the problems. Not what I would want having paid premium prices. BTW, Hyundai Genesis came out as No. 1. Hyundai Genesis is a serious contender however the snobs wont buy it even if it is better than a Mercedes. Hyundai /kia only issue along with residual value mind you c class drops 27 percent in its first year. Most mass produced cars are built cheaply and efficiently. Ile stay with my skoda had it since new serviced it everytime myself and soon to break 500K. All cars are over hyped and over priced all that changes is the body shape lol with added toys and thats all they are is toys and gimmicks.